Style is not just in the major choices, such as whether to have a straight or a gathered sleeve, but also the details. All the possible style adjustments in pattern making software gave me this ‘aha’ moment. Which immediately reminded me of two patterns I’m intrigued by : they’re both shirts yet they’re so different. The differences need an eagle eye for detail, a way of looking at patterns that I’m not used to. Perhaps that’s part of why I’m not a top clothes designer 😀 I found it very interesting to look slowly and carefully at these patterns. Left oop Vogue 2972 by Alice + Olivia. Right McCall’s 5433 by Palmer-Pletsch. – I look better in fitted armhole styles, I don’t look so good in dropped shoulders. – Although a yoke is a classic feature of a man’s shirt, and looks good on me, neither of these has a yoke. Yokes are difficult to fit on my sloping shoulders, but a yoke gives my shoulders more definition, which helps me as I don’t like shoulder pads. – Some people say a style only counts as a shirt if it has no darts, and neither of these patterns passes that test either ! I prefer the shirt on the left, but I’m sure many people like the one on the right – it’s softer and more relaxed in effect, and more suited to the full busted. No pockets in the wrong place ! and the vertical lines of waist darts can have a slimming effect. – 3/4 sleeve (this sleeve is also a bit shorter than the 3/4 sleeve in the right hand pattern). – neck opening worn up even though unbuttoned – that could be because of crisper fabric, or the way the placket is constructed, or the use of interfacing in the front band. – possibly different angle of bust darts, related to possible differences of armhole depth. Personally I get better armhole fit with back shoulder darts, so I might add them to these patterns. 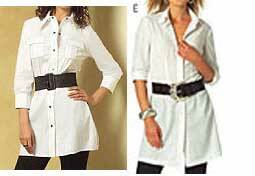 Both have double button detail on the sleeve cuff, though the buttons are placed differently. 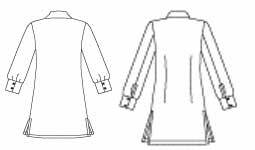 Sleeve placket type not clear from these drawings, but there are several options. The left pattern has an underarm sleeve seam, while the right pattern has the sleeve seam moved to the back so the placket is easier to make. These two shirts don’t include several other shirt style choices such as : different collar / cuff / sleeve widths, different front and sleeve plackets, different yoke shapes. So even something that looks as obvious as a basic shirt actually involves many detailed style decisions. No wonder we’re willing to buy patterns, to pay someone else to choose all the details that ‘look right’ to our individual taste. To use pattern making software to make something equally satisfactory, I would have to be aware of all these details and how they affect the look of the final garment. And I haven’t naturally got that sort of awareness. I expect I could learn a bit about it, but it wouldn’t ever ‘come naturally’. Perhaps my ideal shirt pattern is a combination of these two patterns, details of styling from the Vogue pattern, combined with added waist darts, and shoulder darts or yoke. Perhaps it would be better if I looked for a different pattern altogether, some sort of ‘shirt-blouse’ . . . There are multiple possible patterns for a basic blouse with set in sleeves, wrist cuffs, waist darts, and either convertible (very easy) or band (easy) collar. I think I’ll choose between them just on how I react visually without detailed analysis – though of course the eye can be tricked by the style and quality of the illustrations, the fabric used. . . This entry was posted on December 3, 2009 at 9:59 am and is filed under my choices, pattern making for clothes, personal style. You can subscribe via RSS 2.0 feed to this post's comments. Both comments and pings are currently closed.